A busy commercial city, Los Mochis, the train’s western terminus, is often sweltering and not all that attractive. Most gringos come exclusively to board the train, which leaves the station at 6 A.M. About an hour and a half east of Los Mochis and less than 200 meters above sea level, El Fuerte is quaint and historic. It’s pleasant to visit the small colonial town and spend the night in one of its snug hotels before boarding the train at 7:40 the next morning. The next train station with accommodations nearby is Bahuichivo. 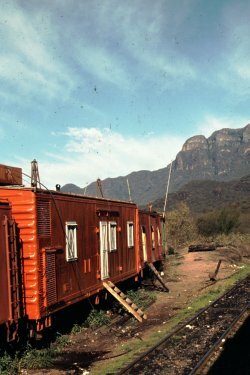 A handful of hotels from Cerocahui, about an hour into the canyon from the station, send drivers to meet arriving guests at the train. Otherwise you can board a dilapidated bus for a long, scary ride to the tiny town of Urique, at the canyon’s base. Cerocahui is a diminutive town with a significant mission church built by Jesuits in the late 17th century. Outside Cerocahui, visit the old Sangre de Cristo gold mine, indigenous burial caves, and a waterfall. Van and horse trips to Urique, at the bottom of the eponymous canyon, can be arranged through the tour operators at the town’s few lodgings. Right across from the mission church, the lodge-like Hotel Mision (688-818-7046, ext. 432, www.mexicoscoppercanyon.com), is part of the Balderrama chain. Outside of town (on the road to the train station), Paraiso del Oso (tel. 800-884-3107, www.mexicohorse.com) is owned by American Doug Rhodes and his wife, Ana. You can arrange horse riding expeditions into the canyon with Doug whether or not you’re staying at his lodge. Beyond Cerocahui, the train stops at El Divisadero just long enough for riders to snap a few pictures and snap up a few rustic handcrafts (pine needle baskets, clay pots, carved wooden dolls) sold by Tarahumara women. 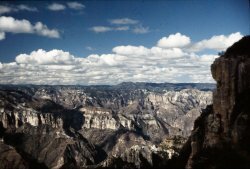 Several comfortable lodges here can arrange walks, hikes, and rides into the canyons. Or just enjoy the comfortable rooms, the bracing mountain air, fine views, and three squares a day. Once reachable by horseback or train, Divisadero is now accessible by road from Creel, just 48 highway kilometers (30 mi) to the west, and by Cerocahui, 68 km (42 mi) south.